Dr. Dente is accused of violating his patient's privacy by distributing this x-ray. Acton, MA Dr. Boca Dente, Jr. DDS faced charges in civil court Monday from a patient who claims that Dr. Boca violated patient confidentiality. 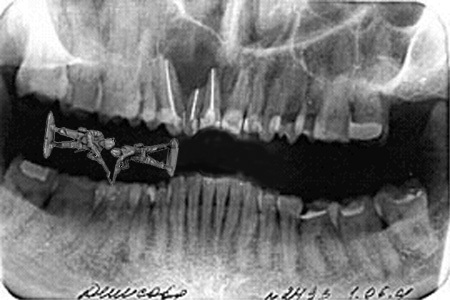 The patient, 37-year-old WWII aficionado Reynaldo Ronald Reynolds, cites a dental x-ray as the crux of his accusations. �When I go to the dentist with my problems, I expect them to stay there, not get spread around,� Reynolds told the judge in preliminary remarks. According to Reynolds' account Dr. Dente took a x-ray of Reynolds� teeth when he came into the dentist�s office complaining of having toy soldiers stuck in his teeth. Dr. Dente does not dispute this point. �He came to me saying that he got the plastic army men stuck in his mouth after trying to use them as tooth picks. Initially he only had one toy stuck, but got the second one stuck after trying to use it to dislodge the first toy,� the Dr. told reporters. What happened next is the point in contention. Reynolds claims that after treating him of his problem, his trusted dentist violating his dental duty by publishing the photo via e-mail forwards. Reynolds said he first found out about when he opened a forwarded message from a friend and compulsive forwarder, Greg Gregorian. The Dr. claims that the he forwarded the photo with no personally identifiable information to a few colleagues for �clinical research purposes.� He says one of these fellow dentists could be behind this, but that even in that case it does not constitute a breach of confidentiality since no name was attached to the photo. Reynolds is seeking $5 million in damages.